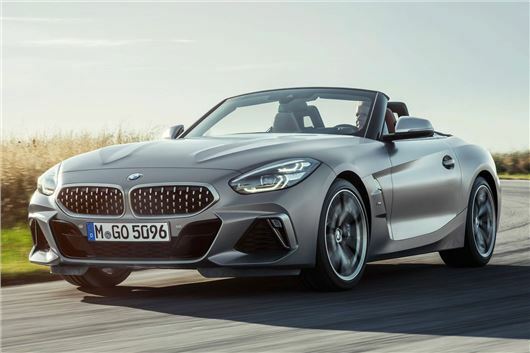 BMW has revealed more details about its new Z4 sports car ahead of its official debut at this Paris Motor Show in October. Buyers will be able to choose from four- and six-cylinder petrol engines. Both four-cylinder engines are 2.0-litre units, with the former badged the sDrive 20i, producing 197PS and 400Nm of torque. It hits 62mph in 6.6 seconds, reaches a top speed of 149mph and returns a claimed fuel economy of 47.1mpg. CO2 emissions are rated at 138g/km. The sDrive 30i has 258PS, along with 400Nm of torque helping it reach 62mph in 5.4 seconds. Top speed is limited to 155mph, while official fuel economy and CO2 figures are the same as the 20i at 47.1mpg and 138g/km. With 340PS and 500Nm of torque, the M40i is gunning for the Porsche Boxster S. The 3.0-litre twin-turbocharged six-cylinder engine takes the Z4 to 62mph in 4.6 seconds. Officially, it will return 38.7mpg and emit 165g/km CO2. All engines come paired with an eight-speed Steptronic automatic transmission, complete with a launch control feature to allow fast getaways. The M40i comes with adapative suspension as well as uprated and an M Sport differential, which BMW says 'elevate the car's sporty handling abilities to even greater heights'. There are three drive modes to select from: comfort, sport and sport+, which drivers can flick between using what BMW describes its 'driving experience control' switch. BMW says the new Z4 is more practical than its predecessor, with a 281 litre boot and extra storage space behind the seats. Large cupholders are fitted in the centre armrest, while roomy door pockets provide extra storage. It's fitted with a host of driver assistance features, too. Collision warning and an autonomous city braking function come as standard, along with a lane departure warning system. Options include active cruise control, while buyers can also opt for a head-up display system. Prices of the new BMW Z4 will be announced on 2 October, with orders being taken two days later from 4 October. Deliveries are expected from March 2019.